Welcoming Matt Vaughn to our RE Vision Division Design/Build team! Welcoming Matt Vaughn to our Revision Division Design/Build team! We are excited to announce a new designer/builder has joined Eberhard Eichner in our Revision Division workshop. You may know Matt Vaughn from around the store and in his role as our Facilities Manager. 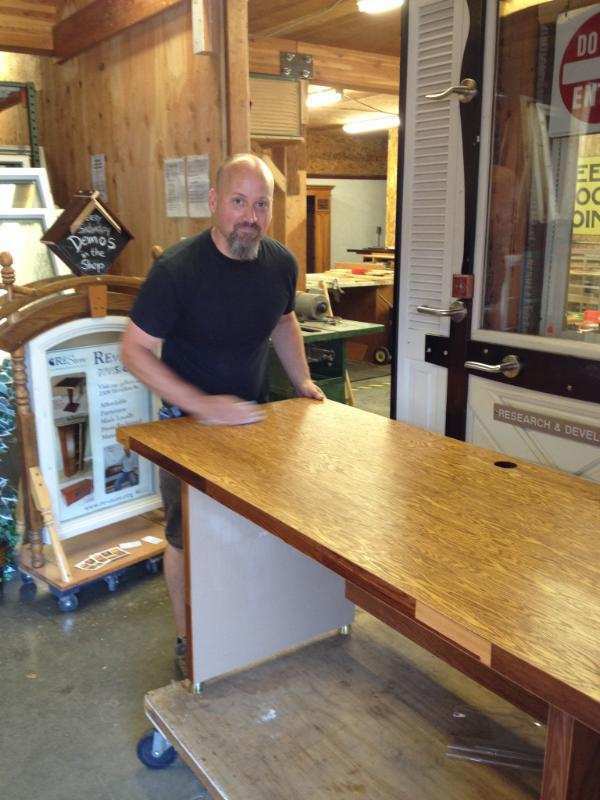 Matt came to The RE Store with over 20 years of experience in building and fabrication with a variety of materials. He gained knowledge in a wide range of manufacturing techniques at The University of Washington where he earned a BFA in Industrial Design and a second BFA in painting. During that time he began working in the building salvage industry in Seattle and developed a love for working with reused materials. Matt has lived in the Pacific Northwest for almost 20 years with the last seven of those in Bellingham. Matt‘s focus in the workshop will be on creating refined pieces that can be recreated, and using these items as a means to help build our green jobs-training program. 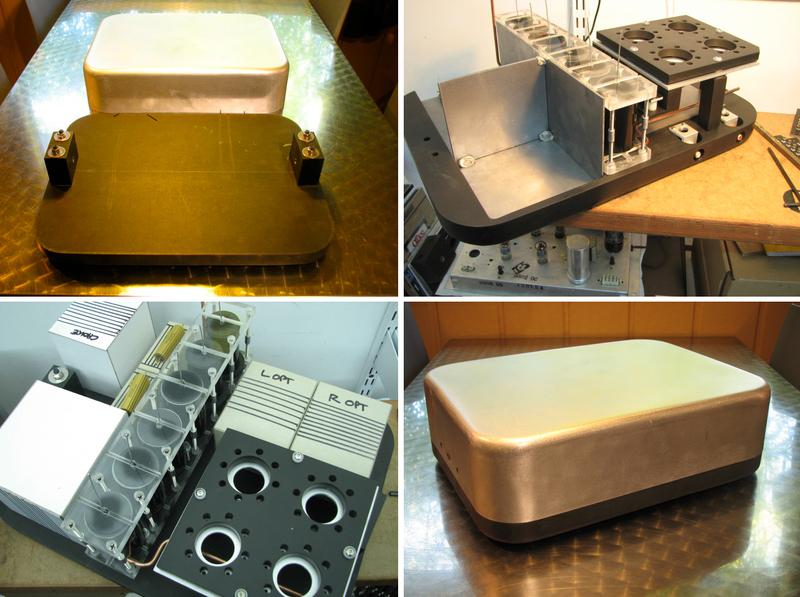 Roasting Pan Amplifier – This is an amplifier intended for the absolute purist. It is very simple electronic construction but with a high degree of quality. The top is an old roasting pan with its handle removed and turned upside down. The base and all of the milled black pieces you see in the later photos are all a salvaged countertop material called Paperstone. This material is made from highly compressed paper waste, so in this instance is “re”recycled. All of the acrylic and aluminum was also salvaged. Once I created a chassis I thought was interesting I had to do some modeling of the interior to ensure I could pack everything in (card/paper model, bottom left photo above). These headphones (above, left) were also created with salvaged Paperstone. I really like working with this material as a sort of Ebony substitute. Most Ebony is not sustainably harvested and the Paperstone presents a great alternative as it mills and polishes to a point that it is almost indistinguishable from Gaboon Ebony. It even has a subtle grain! In this instance the increased mass (Paperstone is quite dense) also aides in vibration dampening and sound isolation. The trick was reducing the weight to a point where the headphones were comfortable enough to wear for longer periods but still have the headphones benefit from the increase in mass. This was done by milling out unnecessary material and creating a hollow wall. These speakers (example of one, above right) feature salvaged Paperstone countertops and aluminum legs that were originally on stools in the dressing rooms of the old Seattle Opera House! Sapele and Mahogany over plywood make up the rest of the construction. You can meet Matt at the store on Saturdays. We also host a regular Open House for our Revision Division where you can discuss your own projects on Saturdays 11am – 3pm, with focused project demonstrations occurring on the third Saturdays of the month. Get ideas from our latest projects or come with questions for yours – and give Matt a warm welcome to the Revision Division team!